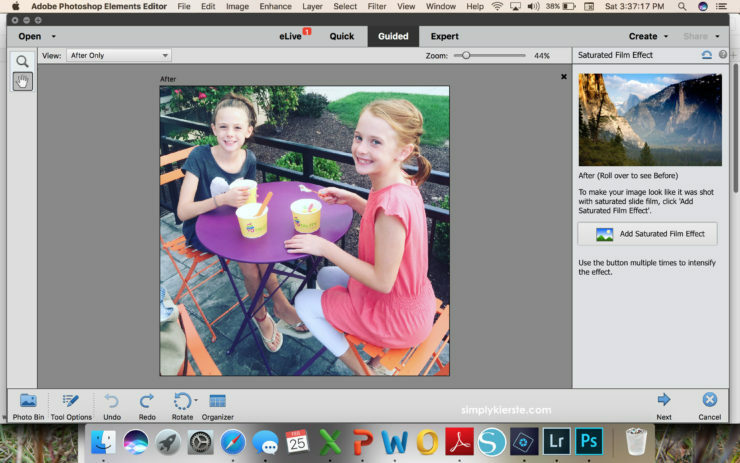 A big thanks to Adobe Photoshop Elements for sponsoring this post! As always, all opinions are 100% mine. Years ago, I made my mom a memo board for her fridge for Mother’s Day, and it was a huge hit. So much so, that she still has it and uses it, and it’s a familiar sight when we go visit. That memo board featured my little boy, who was the only child at the time, but since then we’ve added five more kiddos to our family, so I thought it was about time to update it, and make her a new one! I personalized it even more by adding photos to the bottom, and created a Photo Memo Board...and I love how it turned out! So, so fun! It’s the perfect addition to any kitchen–hang it on the fridge or other magnetic surface, and you’ll have a place to leave little notes or lists. It also makes such a fun gift, and you can customize it with any photos you like. Grandparents, teachers, fathers & mothers (it would be cute on the side of a metal file cabinet at the office! ), would all be perfect recipients. It’s a super easy project–and one that can be finished in thirty minutes or less. Here’s how you can make it too! I started out by editing all my photos in Adobe Photoshop Elements 15. It literally just takes a few seconds to take my pictures and give them a little facelift, and it makes such a huge difference in all of my photo projects. One of my favorite edits is the Saturated Film Effect. It’s a quick and easy one-button edit, and adds a punch of color with that one button! It was the perfect thing for this project, because I really wanted to make sure the colors would pop on my memo board. 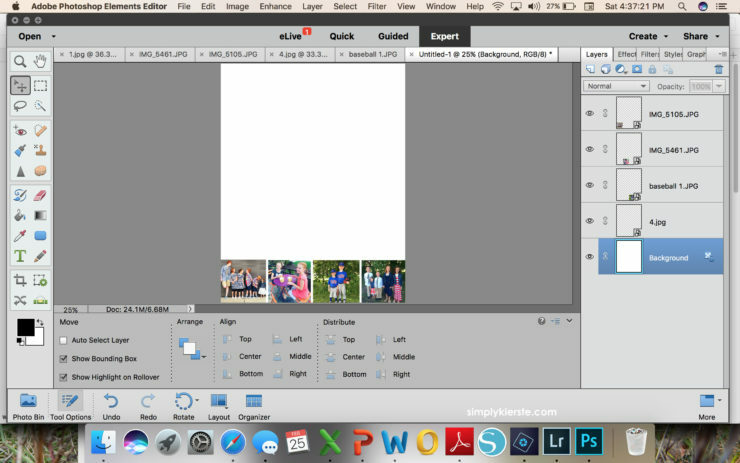 Double click on the photo you want to edit, and it will open up in Saturated Film Effect. Click “Add Saturated Film Effect” and…voila! Love that pop of color! 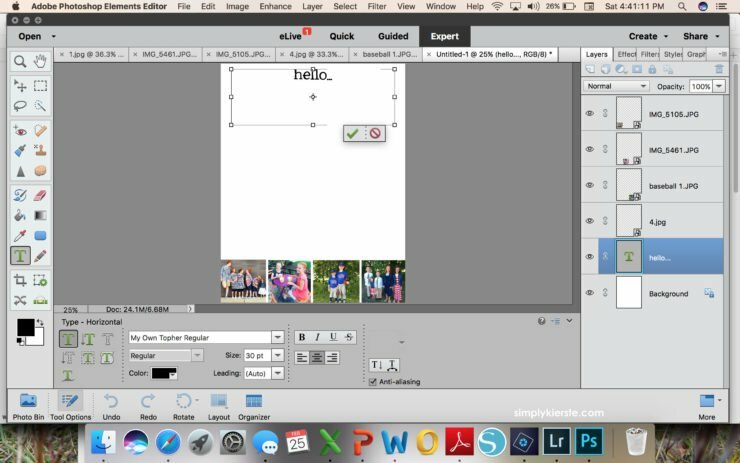 If you need to do any other edits, the Quick Mode has you covered–whether it’s fixing red eyes, sharpening, cropping, or lightening, it’s just a click or two away. Save the edited picture, but don’t close it out. Repeat the process for each photo you want to include. The next step to making this Photo Memo Board is putting all the pictures together in a file that can be printed. It’s easy to do when you switch to Expert Mode. Once you’re there, open a new file. Size it to 7×10, and make sure it’s at a resolution of 300, color mode is RGB Color, and a white background. 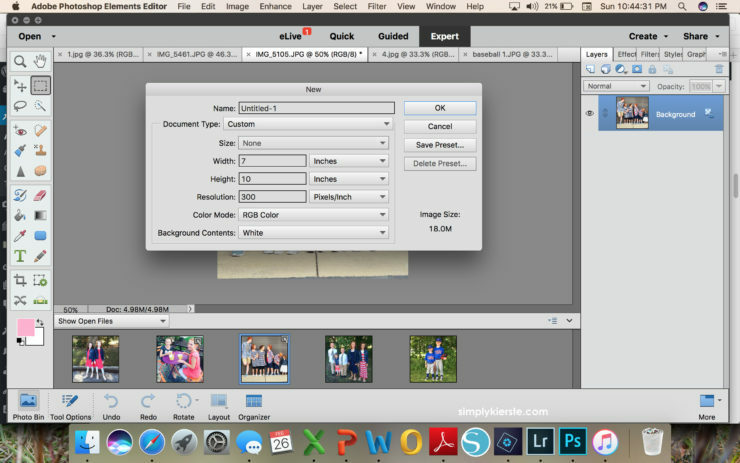 Great news…your edited photos will follow you over to Expert mode! 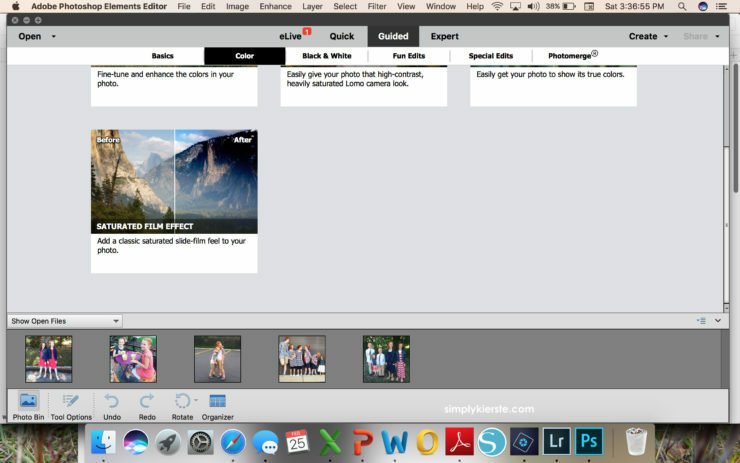 Click on “Photo Bin” in the bottom left hand corner, and all of your pictures will be there where you can see them. 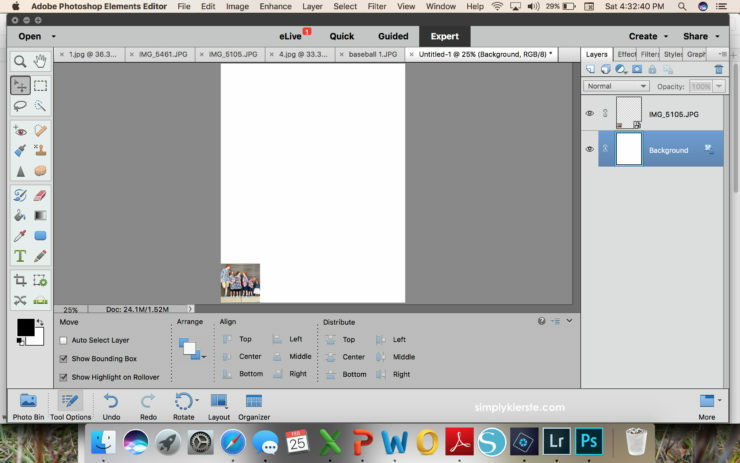 Click on a picture you want to use, and drag it up to your new file. Repeat for all the pictures you want to use. You’ll probably need to play around with the sizing so they’ll all fit, and be the same height and width. This is where it’s important that all your photos are horizontal or vertical! I left a little space in between each photo, because I like that way it looks, but you can always put them right up to each other if you’d rather. Adding your text is next! Click on the Type Tool (green T), select your desired font, size and color, then type your text. Now you’re ready to print on to white cardstock. 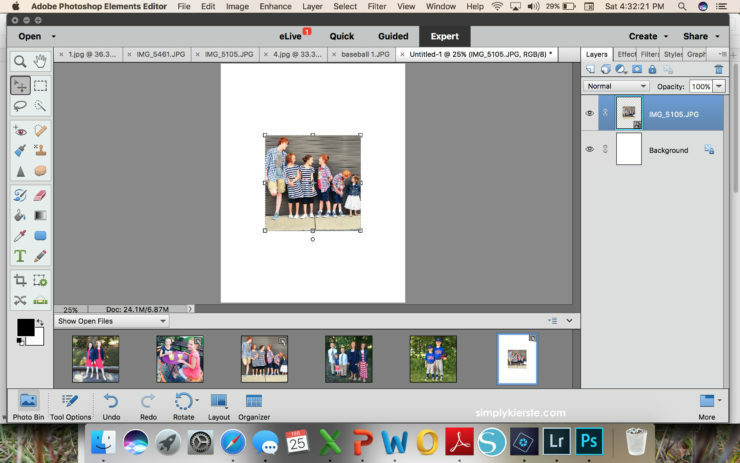 Because you sized it to 7×10, there will be a white border around it when you print, which is exactly what you want. 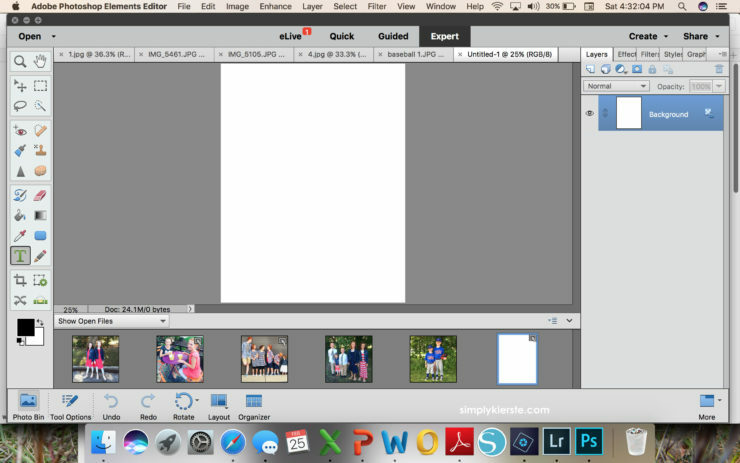 -Trim off the white border, right along the edge of the photos on each side, and back down to 7×10. -Use double stick tape to adhere it (in just a couple of places) to a piece of 8.5 x 11 cardstock or scrapbook paper. -Laminate the memo board. I LOVE having a laminator at home, and you can get a good one for around $20 on Amazon. You can also take it to an office supply store and they can laminate it for you. -Apply magnetic tape in each of the four corners on the back of the memo board, or you can also hot glue small magnets on instead. -Punch two holes at the top of the board, and tie a few ribbons through them. And you’re set! 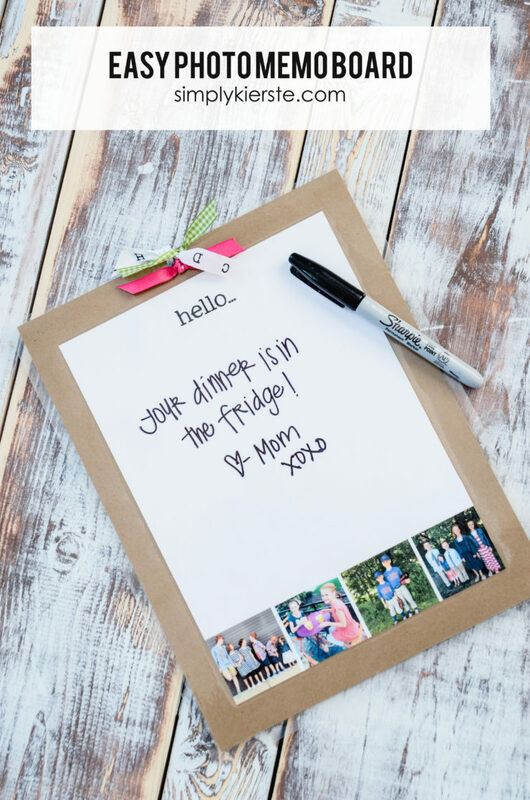 You’ve got an adorable, personalized Photo Memo Board!